Oh my.. this is superb! I love the painted background and your photos are delightful! Your title also looks great! This is so cute - I love the softness of it! He was just adorable as a bub! I love how you've painted the bubble wrap and masked onto the CS! Just a gorgeous LO! Awesome! Love the bubble wrap stamping! Love your stamping and those photos are so cute!! He is gorgeous! This is lovely! I just love how you've used the bubble-wrap stamping. Terrific LO and what a gorgeous little bloke. 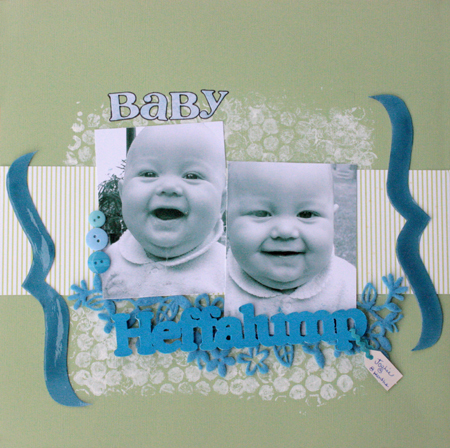 Too cute and a great stamping idea! Love the bubble wrap painted background. Have wanted to try that technique for forever but haven't yet been brave enough. Looks like you've mastered it tho. Well done!